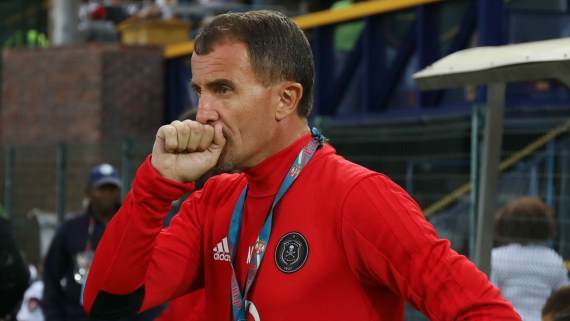 Orlando Pirates coach Milutin Sredojevic says he would have slapped Bungani Zungu for his recent comments alluding that assistant Rulani Mokwena was responsible for Bucs' success. The Amiens midfielder created a social media storm in South Africa when in a tweet he suggested that it was Mokwena who brought success to Pirates, as well as former side Mamelodi Sundowns. The injured Bafana Bafana international later issued an apology for his comments on the same social media platform. Sredojevic said: "I need to tell you something. If a player that I made...Nemanja Matic (for an example) has done (what Zungu did) to any coach, I would personally slap him. "But if someone else does this, as I told you it's not important, but I really know that I'm in charge as a head coach. "I know that I have a very strong team that is led by me and assistant coach Rulani and I am happy with those things. "Regretfully this is what has happened. I will just say it has been unfortunate and you know, personally I believe that it has passed and it's gone. Everyone has a right to his opinion. Let the football talk instead of us." The Sea Robbers currently top the Premiership standings on 23 points from 13 matches played and are next in action on 24 November in a Telkom Knockout semi-final against Kaizer Chiefs.